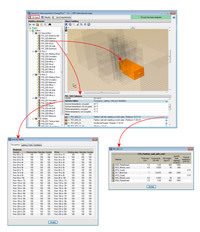 EnergyPlus is a thermal and energy simulation program developed by the DOE (U.S. Department of Energy) with which users can estimate energy demand and consumption in buildings. CYPECAD MEP exports the introduced data to EnergyPlus from the Air Conditioning tab and also uses EnergyPlus as an analysis motor (version 9.0) to obtain the thermal requirements of a building; all thanks to the Export to EnergyPlus module. CYPECAD MEP provides users with the benefits of EnergyPlus in two ways: by exporting the data that has been introduced to this program or by using it as analysis motor in CYPECAD MEP. Both options are possible using the Export to EnergyPlus module and are executed from the same program option: File > Export > EnergyPlus, in the Air Conditioning tab. This option carries out the export by generating an IDF format file (Input Data File), which can be read by EnergyPlus. A simplified export for each precinct group in the Air Conditioning tab. 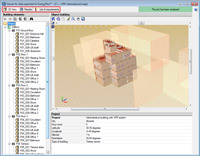 Once the desired option has been selected, a dialogue box will appear with a 3D view of the building, and a name and location for the IDF file, which are provided by default, and can be modified by users. The dialogue box also displays the option to Execute “Viewer for data exported to EnergyPlus” when the export has finished. If this option is activated, EnergyPlus will be used as the analysis motor in CYPECAD MEP. If it is not activated, the program only generates the IDF export file, which can be read by EnergyPlus, but has to be installed as an independent program. EnergyPlus can be downloaded from its official website. The work environment of EnergyPlus is based on numerical data introduction, and the results are also displayed in the same way. The export to EnergyPlus process uses the data introduced in CYPECAD MEP via its graphics interface and avoids the tedious task of having to introduce all the data using numerical values. Once the analysis has been completed with EnergyPlus, users can obtain results, which can then be checked without interference from any other software. In any case, users usually use this important and renowned thermal and energy analysis tool in an environment which not only allows them to introduce data in a graphical and intuitive way, but also obtain reports automatically, to justify compliance with the standards of the building. All this is possible using EnergyPlus as the analysis motor in CYPECAD MEP. CYPE has acquired the license allowing the use of EnergyPlus as the analysis motor of CYPECAD MEP, to offer its users the benefits of this renowned program, without the need of having to install it independently. It can also be used to generate reports automatically so to allow users to verify the correct energy and thermal operation of the building being designed. Displays the data exported to EnergyPlus. Analyses the building using EnergyPlus and provides a view of the results. 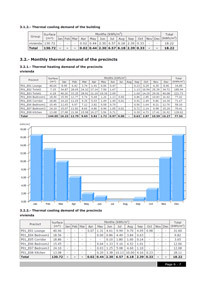 Monthly and annual heating demands of all the heated precincts of the building, as well as the minimum temperature reached each month for the non-heated precincts. Monthly and annual cooling demands of all the cooled precincts of the building, as well as the maximum temperature reached each month for the non-cooled precincts. The time required to analyse the job using EnergyPlus may be lengthy as the thermal requirements are studied for all the hours of the year and for each precinct of the building.